Pac-man: "GameCube is the best console !" Extra: Pac-man vs. is bundled with R:Racing Evolution and Pacman World 2, and was offered when pre-ordering I-Ninja. "The arcade classic that gobbled up millions of fans is back with a wild multi-player twist as Nintendo and Namco form a Pac-Man pact! 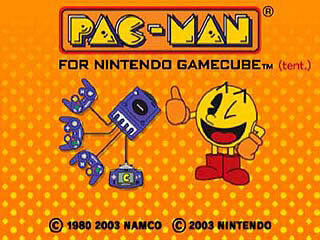 Nintendo's own Shigeru Miyamoto, driven by his desire to create an updated version of his favorite game, Pac-Man, contacted the game's original creator, Mr. Iwatani of Namco, for this project. Pac-Man, which debuted in 1980, is one of the definitive arcade games of all time. It has generated many hit sequels, though nothing like this! 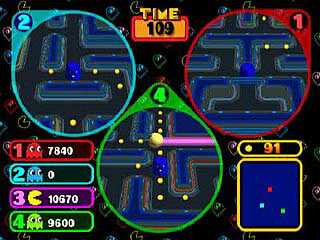 Pac-Man must navigate mazes, eating Pac-dots, Fruit, and Power Pellets as he dodges hungry ghosts. The game plays like the original arcade classic -- but this time, human characters control the ghosts! 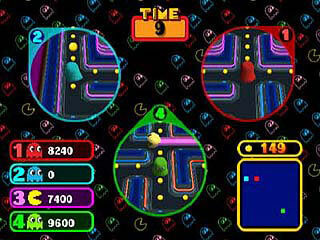 An innovative rendition of the arcade favorite, three players control the ghosts on the television screen while the fourth player, controlling Pac-Man, tries to avoid them on the Game Boy Advance. 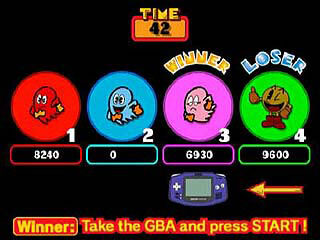 When a ghost eats Pac-Man, it's time to pass that Game Boy Advance to the winning ghost, and continue the fun! 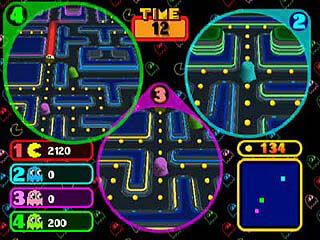 The lead player, viewing the entire maze on the Game Boy Advance, must avoid the other three players controlling the ghosts on the television screen. To raise the tension factor, the three ghost players can only see part of the maze around their characters. 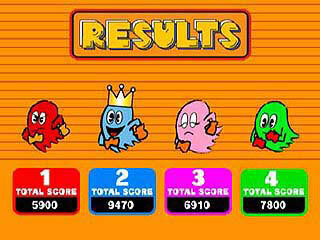 Pac-Man must clear all the Pac-dots in each maze to progress to the next."